Updated: 3:23 p.m. | Posted: 2:47 p.m. The mining company that wants to build a nearly $3 billion underground copper-nickel mine near Ely is suing the federal government to try to keep its federal mineral leases to keep the controversial project moving forward. Twin Metals Minnesota filed the suit in U.S. District Court in Minnesota Monday to try to invalidate a recent opinion from the U.S. Department of the Interior that declared the company doesn't have an automatic right to renew its leases. Those leases, located southeast of Ely near where the South Kawishiwi River flows into the Boundary Waters Canoe Area Wilderness, were first issued 50 years ago. They've since been renewed twice with little fanfare, most recently in 2004. The company has been exploring and drilling test holes on those leases for several years. That exploration formed the basis of a study the company released in 2014 that laid out the potential for a 30-year mine likened to an "underground city" that could employ 850 people mining 50,000 tons of ore per day. Twin Metals applied to renew them again three years ago. The company argues that nothing has changed since the last time the leases were renewed, and says the government should grant it another 10-year lease. But the legal opinion issued in March by the Interior Department's Solicitor concluded that the Bureau of Land Management has the discretion to grant or deny Twin Metals' Lease Renewal application. "The legal opinion was an abrupt, 180-degree reversal from 50 years of precedent that the agencies have taken towards these leases," said Bob McFarlin, government affairs advisor for Twin Metals Minnesota. "The only thing that has changed in those 50 years is the pressure that is being put on the federal agencies by anti-mining organizations." That pressure should not allow the government's legal position to change and "is not the right way to have federal agencies conduct legal and regulatory processes," said McFarlin. 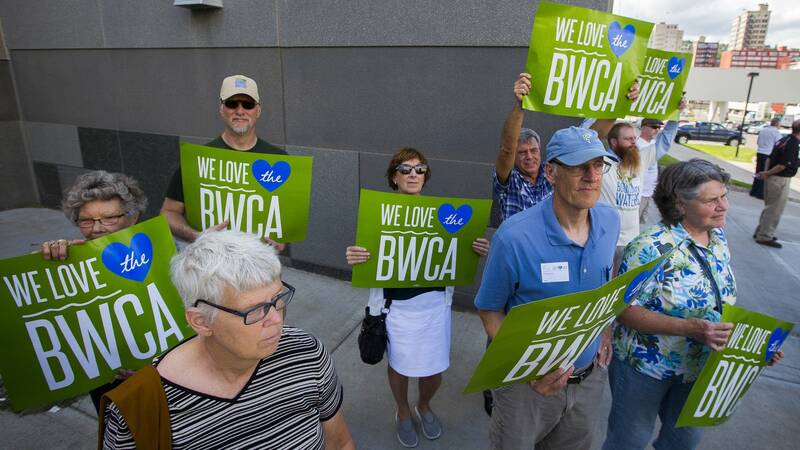 Much of that pressure has come from the Campaign to Save the Boundary Waters, which has argued that the watershed of the wilderness is the wrong place to build a copper-nickel-precious metals mine, with the potential to cause severe water pollution. "It is a longstanding fact that renewals of the Twin Metals federal mining leases are discretionary," said Becky Rom, National Chair of the campaign in a statement. "The Bureau of Land Management's Authority to renew or deny renewal based on science and proximity to the Boundary Waters Canoe Area Wilderness is absolutely clear." The Interior Department's legal opinion set in motion a chain of events that could lead to the government denying Twin Metals' renewal of its federal leases. After the opinion was issued, the Bureau of Land Management asked the U.S. Forest Service whether it would consent to the BLM renewing the leases. Because the leases are located on the Superior National Forest, that consent was required before the BLM could decide whether to renew the leases. The Forest Service then announced in June that it may withhold its consent to the lease renewal, stating it was "deeply concerned by the inherent risks associated with potential copper, nickel and other sulfide mining operations" within the Boundary Waters watershed. The agency asked for public comment on the issue and held emotionally charged public listening sessions in Ely and Duluth this summer, with people speaking out passionately both for and against potential mining near the wilderness. Opponents of the project say they submitted more than 65,000 public comments to the federal agencies. "The BLM and U.S. Forest Service have heard from thousands of people that sulfide mining on the edge of the wilderness is an unacceptable risk," Paul Danicic, executive director of the Friends of the Boundary Waters Wilderness, said in a statement. "Twin Metals' lawsuit seeks to silence them." The Forest Service is expected to announce its decision on whether to consent to the lease renewal in coming weeks. The lawsuit, and the Forest Service's action, have no effect on the proposed PolyMet copper-nickel mine, which is located southwest of where Twin Metals is exploring. PolyMet is located in the watershed of the St. Louis River, which flows into Lake Superior. Furthermore, PolyMet controls all the mineral rights on its project, none of which are federal leases. Unlike Twin Metals it is not required to submit leases for federal renewal. Twin Metals, a subsidiary of the Chilean mining giant Antofagasta, says it has invested $400 million into developing the project. If the government's legal opinion is not overturned, the company says it will "strip" the company of its mineral rights. It could also cast into doubt the future viability of other mining companies exploring for copper, nickel and precious metals in the watershed of the Boundary Waters. "With our project and the effect that opinion has on other projects in the future, hundreds and maybe thousands of long-term jobs are at stake for northern Minnesota, along with the potential of billions of dollars in investment and economic development." said Twin Metals' McFarlin.